04/07/2010 Sayyed Mohammad Hussein Fadlullah was born in Iraq’s holy city of Al-Najaf on November 16, 1935 /1354H. He was raised and educated by his father who greatly influenced the life and thought of his son. His father Sayyed Abdul Ra`ouf Fadlullah: Born in 1325H/, went to Najaf and studied with Mirza Fatah` Ash-Shahid, Sayyed Abul Hassan Al-Asfahani, and Sayyed Abdul Hadi Al-Shirazi. He became a prominent scholar and a widely sought and appreciated teacher. He stayed with his brother, Sayyed Muhammad Sa’id and went to the south of Lebanon when the latter died. There he continued his studies and became a religious authority capable of issuing religious decrees (Fatwas). He was known for his piety asceticism and good morals. He had a great influence on his son who benefited a lot from him until he died. Sayyed Fadlullah went first to a traditional school (Kuttab) to learn the Quran and the basic skills of reading and writing. Then he went to a modern school where he stayed for two years and studied in the third and fourth elementary classes. Sayyed Fadlullah began Islamic theology studies at a very young age. He also used to take great interest in the whole cultural and literary scene, which he followed up by reading Lebanese, Egyptian and Iraqi magazines and newspapers. Sayyed Fadlullah also studied the Arabic language, logic and Jurisprudence, and some philosophy. He did not need another teacher until he studied the second part of the course known as Kifayat al Usul which he studied with an Iranian teacher called Sheikh Mujtaba Al-Linkarani. He attended the Bahth Al-Khariji (External Research) in which the teacher does not restrict himself to a certain book but gives more or less free lectures. Sayyed Fadlullah attended the Bahth Al-Khariji of some of the greatest scholars and religious authorities of that time including: Sayyed Abulkassim Al Khou’i, Sayyed Mohsen AL-Hakim, Sayyed Mahmoud Shah`roudi, Sheikh Hussein Hilli, Mullah Sadra Al-Qafkazy who was known as Sheikh Sadra Al-Badkoubi. When Sayyed Fadlullah was only ten or eleven years old, he joined hands with some friends in publishing a hand written magazine they called Al-Adab. He then took part in editing the Al-Adab magazine (1380H) that was published by Jammat Al- Ulama (Scholars’ Group) at Najaf. He used to write the second editorial called “Kalimatuna” (Our Message) and these articles were then compiled in a book called, “Our issues in the light of Islam”. The first ”Our Message” editorial was written by Martyr Sayyed Mohammed Baqir As-Sadr. After 21 years of studying under the prominent teachers of the Najaf religious university, Sayyed Fadlullah concluded his studies in 1966/1385 H and returned to Lebanon. He had already visited Lebanon in 1952 where he recited a poem mourning the death of Sayyed Muhsin Al-Amin. In 1966 he received a invitation from a group of believers who had established a society called ”Usrat Ataakhi” (The family of Fraternity) to come and live with them in the area of Nabaa’a in Eastern Beirut. Sayyed Fadlullah agreed, especially as the conditions at Najaf impelled him to leave. In Naba’a, he began organizing cultural seminars and delivering religious speeches that discussed social issues as well. Nevertheless, his main concern was to continue to develop his academic work. Thus he founded a religious school called” The Islamic Sharia Institute” in which several students enrolled and later became prominent religious scholars including Martyr Sheikh Ragib Harb., one of the main founders of the Islamic Resistance in Lebanon. He also established a public library, a women’s cultural center and a medical clinic. When the Lebanese civil war erupted in 1975, he was forced to leave the Naba’a neighborhood. He moved to the Southern suburb of Beirut where he gave priority to teaching and educating the people. He used the Mosque as his center for holding daily prayers giving lessons in Quran interpretation, as well as religious and moral speeches. He even opened a religious school in the Sayyeda Zeinab (daughter of Imam Ali and sister of Imam Hussein pbut) neighborhood in Damascus, where he used to teach regularly. Sayyed Fadlullah was a staunch fighter against arrogance and for the cause of freedom. He supported the international liberation movements and devoted his efforts to guide and back the international Islamic movements. In this context, he took part along with Martyr Sayyed Muhammad Baqir As-Sadr in founding the Islamic Movement in Iraq as a first step towards an Islamic movement in the Shiite sphere. Then, in the late seventies, he announced his support to the Islamic Republic of Iran and the Islamic movement in Lebanon with all the means possible to ensure its success: speaking, writing, and defending its major arguments at every opportunity. In his sermons, he strictly called for armed resistance to the Israeli occupations of Lebanon and Palestine, along with opposition to the existence of Israel. The media described him as the spiritual guide of the resistance. Before long he became the target of several assassination plots executed by local regional and international intelligence services. On March 8, 1985, a car bomb equivalent to 200 kg of explosives went off at a few meters from his house in the Bir El-Abed neighborhood in Beirut’s southern suburb. 80 people were martyred and 256 were wounded, most of them were children and women. The blast destroyed a 7-story apartment building, a cinema. The attack was timed to go off as worshippers were leaving Friday Prayers. “Sayyed Fadlullah escaped injury, as a woman had stopped him at the mosque seeking a few answers to some religion-related questions. 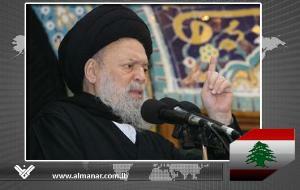 Sayyed Fadlullah accused the US, Israel and its internal allies of being behind the explosion. In addition to academic and religious activities, Sayyed Fadlullah concentrated on social activities. His Mabarrat Association was born, and it soon became one of the greatest pioneers and models in this field. The association which began its activities by building orphanages expanded and began to build social and medical centers as well as mosques. The Mabarrat has now nine orphanages, two medical centers nine schools, one Vocational School, eight Islamic centers and other Media and Information centers.